Richard Lockridge speaks on the Norths. To celebrate today's birthday of Richard Lockridge (1898–1982), a journalist and co-creator of the sleuthing couple Pam and Jerry North, listen to this 17-minute talk by him from the June 1954 Books and Authors Luncheon (found in the WNYC Radio archive). He is introduced at about 18.30 minutes into the program and speaks about the genesis of the Norths in the pages of the New Yorker, which involves anecdotes on life with his wife, Frances. He praises Frances's plotting ability and mentions that 3.1 million people are expected to listen to the Mr. and Mrs. North radio program that night. He also states that gas is 20 cents a gallon (remember those days?). Also on the program: critic and Columbia University professor Jacques Barzun, talking about his book God's Country and Mine (on the United States, which he calls "the greatest hodge-podge that has ever been"). Norma Herrmann on her husband's work. This short interview on the BBC Radio3 InTune program with Norma Herrmann, widow of composer Bernard, provides insight on Herrmann's initial reaction to Martin Scorsese regarding Taxi Driver and his relationship with Hitchcock (includes some clips from Herrmann's compositions for North by Northwest and Psycho). Lock Up: "Sentenced to Die" (1960). The TV series Lock Up (1959–61) drew on the cases of Philadelphia attorney Herbert L. Maris for its material. The episode "Sentenced to Die" features Macdonald Carey as Maris, who takes on a client convicted of killing his former boss. The episode costars Angie Dickinson and was directed by Christian Nyby (Adam-12, Emergency!). 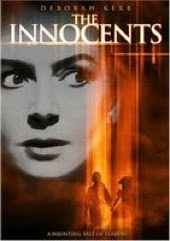 BBC Radio 3 discussion of The Innocents (1961). The BBC Radio 3 program Night Waves has a fascinating discussion of the 1961 film The Innocents (adapted by Truman Capote and Rumpole's John Mortimer from Henry James's "The Turn of the Screw"). Panelists include Peter Wyngarde and Clytie Jessop, who appeared in the film as Peter Quint and Miss Jessel respectively. British Library Fellow on the first audiobooks. Matt Rubery, an Edison Fellow at the British Library, provides an interesting account of the first audiobooks in the United States (1934) and Britain (1935). One of the earliest British audiobooks? Agatha Christie's The Murder of Roger Ackroyd. Happy birthday, John Creasey: The Baron (1966-67). To celebrate today's birthday of the indefatigable John Creasey (1905–73, who published at least 500 mystery works), look at "The Seven Eyes of Night," an episode of The Baron, a TV series (loosely) based on Creasey's character John Mannering. In this incarnation, antiques dealer/secret agent Mannering (Steve Forrest) pursues con artists (including an unscrupulous Jeremy Brett) who fleeced him out of a large sum of money. Elmore Leonard on marketing his works. After author Elmore Leonard died on August 20, the manuscript archivist at Indiana University's Lilly Library posted on the library blog about the small Leonard collection at the library, including an excerpt from a Leonard letter to his agent: "So what I'm going to do now is plot better stories. I'll show 'em." Update. 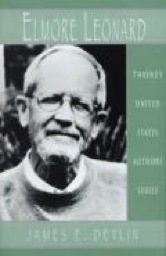 Here are some clips of Elmore Leonard from WNYC's Leonard Lopate Show. 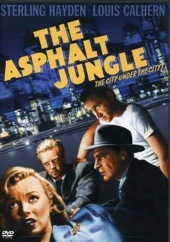 WQXR: "The Dark Drama of Film Noir." A recent rebroadcast from the WQXR radio series Movies on the Radio was "The Dark Drama of Film Noir," focusing on film composers Adolph Deutsch, Bernard Herrmann, Miklos Rozsa, and Max Steiner. Sherlock Holmes' Fatal Hour (1931). This film, once considered lost, is based on Arthur Conan Doyle's "The Final Problem" and "The Adventure of the Empty House" and features Arthur Wontner as Sherlock Holmes. The U.S. title is Sherlock Holmes' Fatal Hour; the British title is The Sleeping Cardinal. 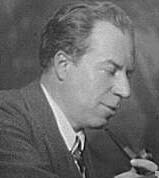 The director is Leslie S. Hiscott, who also brought A. E. W. Mason's Inspector Hanaud to the screen. Newly digitized Baker Street Four-Wheeler. Congress, Prints & Photos Div. The Houghton Library blog at Harvard brings word of its digitization of A Baker Street Four-Wheeler: Sixteen Pieces of Sherlockiana (1944, ed. Edgar W. Smith), which features goodies such as "Sonnet to Sherlock" by author-critic Anthony Boucher and "Sherlock Holmes's Prayer" by BSI founder Christopher Morley. "Strengthen me," writes Morley as Holmes, "not to astonish the good Watson merely for theatrical pleasure." Although this work lists "The Man Who Was Wanted" as a tale penned by Arthur Conan Doyle, it was not; go here for an explanation of its history. 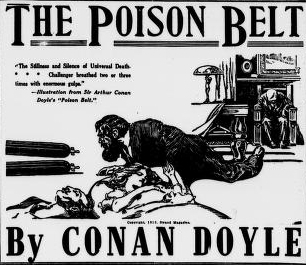 Sept 1913: Conan Doyle's The Poison Belt appears in NY. For who, having once met the Professor, would not desire to continue the acquaintance? Hardy Boys author Leslie McFarlane recalled. The Canadian Broadcasting Corp. remembers the death on September 6, 1977, of highly successful Canadian author Leslie McFarlane with this 1972 interview; he wrote some of the Hardy Boys and the Dana Girls mysteries, among other works. Below: Target Berlin (1944), with a script by Leslie McFarlane. House on Greenapple Road (1970). In House on Greenapple Road Marian Ord (Janet Leigh), wife of advertising salesman George (Tim O'Connor), goes missing; and Lt. Dan August (Christopher George) finds a bloody kitchen and a complex case when he begins to investigate. Julie Harris, who died on August 24, appears as George's sister Leona; also featured are Ed Asner, Walter Pidgeon, Eve Plumb, Barry Sullivan, William Windom, and Keenan Wynn. This TV movie (produced by Quinn Martin and based on the book by Harold R. Daniels) inspired the later series Dan August with Burt Reynolds.